We are living in a time period where we are seeing, on a daily basis, more and more of our natural resources becoming endangered or becoming extinct. 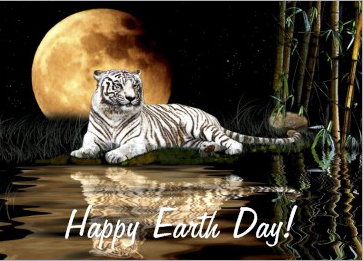 Everyday should be Earth Day, but please, today especially, take the time to get some of the facts about our planet. We currently have a major nuclear disaster, a massive oil spill that is going relatively uncleaned up, an ocean that is filling with plastic, increasing temperatures due to loss of atmosphere, and rainforest that is over 50% deforested in less then 50 years. http://www.wwf.org/ and chose your country. We recently did a symbolic adoption of a tiger through the WWF. Currently the tiger is the most endangered species on the planet. http://www.worldwildlife.org/ogc/species_SKU.cfm?gid=33 — scroll down for various price ranges for you to donate. This is a fun way to donate to the WWF and help save a beautiful creature, that has less then 3500 members of its species left in the wild. We’ve all been to clubs or parties with more attendees then that. It’s scary. So whether you donate to the WWF, or your favorite organization, volunteer or go out of your way to buy products made from recycled or biodegradable material, help make today matter, and every day. It is up to us as stewards of this planet to help to restore and preserve it, after all, it’s where we live!